When it comes to pet shampoos, there are as many choices as there are coat types. 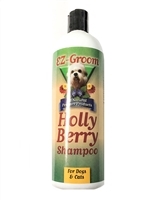 It is important to choose the right shampoo to match your pet’s skin and coat’s needs. Because your dog's skin and hair have different requirements than yours, it only makes sense to use a shampoo designed specifically for his needs. Dog shampoos should indicate if they are formulated for dry, normal or oily skin types. Before you begin, think about why you are washing your dog. Is he smelly, itchy, has fleas or simply dirty from playing outside? Deep cleans even the dirtiest pet! Will add texture and body to lifeless and tired coats. It is enriched with peppermint, lavender and chamomile extract. This wonderful moisturizing shampoo is a mild baby shampoo concentrate.